Who is Head Cook Harry? 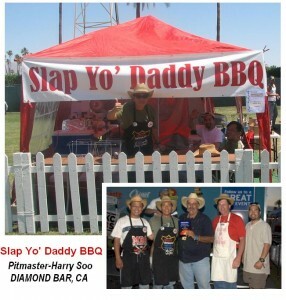 Slap Yo Daddy BBQ is the love child of TLC’s BBQ Pitmasters Head Cook Harry Soo. Preparing a bucket list of wishes to do before kicking the bucket, he started competing in 2008. And the rest, as they say, is history. Slap Yo Daddy BBQ, one of the top-ranked Kansas City BBQ Society teams in America, was chosen among over 5,000 professional teams to appear on TLC’s BBQ Pitmasters Season One in 2010. In the Season Finale, SYD stunned the nation by defeating all the teams in the show including two BBQ World Champions in the winner-take-all Rib Throwdown in Texas. Awarded California Team of the Year 2010 & 2011; Arizona Team of the Year 2010 and 2011; 2010 Grand Champion in Langley, Canada; 2012 Hawaii State Champion, 2012 British BBQ Champion at Cartmel, UK; 2010 3rd ranked Kansas City BBQ Society (KCBS) team in the nation; 1st KCBS Ranchers Reserve National Brisket Cup 2010; 1st KCBS Ranchers Reserve National Beef Cup 2011; 2012 KCBS Chicken Team of the Year and winner of 27 Grand Championships including a history making 1st place in all four meat categories in the 2009 Way Out West BBQ Championship has proven this BBQ team knows their stuff. He’s received many awards including Reserve Grand Champion in Kansas City in 2009 amid 162 of the best teams in the nation at the Great American BBQ and 80+ first place finishes in various categories and countless 2nd, and 3rd place finishes. Clearly, Slap Yo Daddy BBQ are masters at the grill, so you’ll just have to check Harry out for yourself. The Slap Yo Daddy two-man team was formed in 2008 and is made up of Head Cook Harry (member KCBS, IBCA, and CBBQA, and certified KCBS BBQ judge) and Assistant Cook Mark. By day, Harry and Mark work at information technology jobs in a Dilbertesque existence. On weekends, they love to cook and hang out with friends and family. In 2010, Benny joined the team as Mark left to spend more time with his wife and family. In 2011, Harry became a one-man team as Benny returned to cooking on his team as Funtime BBQ. How did Harry get started? Our entry into the competitive circuit was purely by chance. Harry had been fascinated by BBQ contests on Food TV and his co-worker Janice had asked him to help out with the annual fund raiser for the African American Association at work. So for the past several years, Janice helped Harry serve BBQ brisket to several dozen co-workers, many of whom were African American with roots in the South. They received many compliments including, “This is the best BBQ I’ve eaten. You should enter a contest”. Nothing happened until early 2008 when the movie The Bucket List starring Jack Nicholson and Morgan Freeman was released. Harry’s co-worker Teri suggested that they prepare a bucket list of wish things to do before “kicking the bucket.” The caveat being that, in addition to your own list, your fellow co-workers could add “stretch” goals for you with activities that would be a challenge given your particular personality. Two of Harry’s stretch goals were 1) compete in a BBQ contest and 2) attend a comedy class and do a stand-up act. 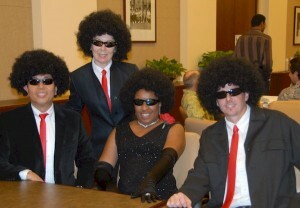 Harry began competing in BBQ contests in March 2008 and substituted #2 in February 2008 by being a backup dancer for Janice during their company’s Idol contest and winning first place (see video – Janice is lead singer, Teri is in the middle, Harry is on the left, and another co-worker Brian Rosellen is on the right) . How did you come up with a name like Slap Yo’ Daddy BBQ? There is a saying in the south, where Janice is from, that when you eat something you like, you want to go slap somebody. That’s how they coined their team name. The meat is so good, you want to slap someone. Since Harry is a single Dad, the team name became Slap Yo’ Daddy BBQ. What was your BBQ journey like? Janice, co-workers, and friends continued to help Harry fine-tune his many disastrous BBQ cooking attempts on chicken, ribs, and pork until the BBQ was edible. Harry joined the California BBQ Association in March 2008 and found many supportive mentors including Kristin, Bentley, and Thom who encouraged him to enter his first contest. After joining the Kansas City Barbeque Society (KCBS) and with little equipment and a lot of chutzpah, Harry persuaded his childhood buddy Mark to come along for the thrill ride. Amid the many mishaps (see Blog), they won First place in chicken and Reserve Champion on their first outing and were immediately hooked by competition BBQ. In competition BBQ, the meat is cooked low and slow around 225 degrees for up to 12 hours and submitted for blind judging in 9” X 9” white Styrofoam containers. Four meats are turned in by each team: chicken, ribs, pork, and brisket. BBQ contests have to be sanctioned before points are counted towards the California Team of the Year (TOY) or Rookie Team of the Year (ROY) awards. The two major sanctioning bodies are the Kansas City Barbeque Society (KCBS) or International Barbeque Cookers Association (IBCA). A sanctioning body is like the PGA for golf. KCBS is the larger body based out of Kansas City and turn-in trays typically have lettuce and parsley as decorations (see banner photos). Turn in for chicken is at noon and the other three meats follow after each half-hour (KCBS Rules). The IBCA, of Texas origin, favors turn in trays with just the meat on foil (aka Texas lettuce; see banner photos) and turn ins are done every hour starting at noon for chicken and ending at 3 pm for brisket (IBCA Rules). I’d like permission to use your recipes in cookbooks for single and Handicapped. You would be listed in the credits, and any cookbooks you offer will also be mentioned (suggested for purchase). tried to order your competition hot rub for your umami brisket recipe but was denied. my zipe code is 19901 (dover de), that’s in the usofa,wuzup? I love to cook, am good at it and would like to work with you. I am recently retired 3 days. Come by and say hello at the various events I’ll be at (see my Schedule page). Thanks for your offer to help but I have assistants already for my classes and for my events. This is Randy Butler. I worked with you at MWD. I have retired & have been working on perfecting my smoking skills. I placed an order from soup base for 5 lbs of your rub. Keep up the good cooking ! What a fabulous history you have, huh? Phenomenal! Loved you on TLC’s BBQ Pitmasters and say hi to chicken hat Harry. What a great opportunity you have given to everyone for this sweepstakes. You are number one – anyone winning this sweepstakes is one very lucky person! Thank you – Good luck to all. I found you on YouTube looking for ways to smoke brisket Your video presentation was far, far superior to others (who spend way, way too much time jabbering about nothing). Not a moment was wasted but all so informative. When I got a glimpse of your porch and the various BBQ setups I was hooked. My kind of guy. When I read your story on this website I’m hooked to SYD solid like a big bass. I’m a 66 yr old retiree in Glasgow, Missouri who will BBQ at the drop of a hat. I’ve no desire to enter any competitions but so, so love the time spent outside tending a smoker or grill. I am a subscriber to your videos and hope you will be in my area so I can visit you at a competition. Thanks so much for the lessons and please keep them coming. All the best….. Thanks Jim for stopping by. I’m in your age range so an old fart (I speak for myself) like me just wants to give away my secrets of winning as I can’t take it with me when I checkout! Please keep spreading BBQ love.